With global hits like Carolina, Burguesinha, Tive razão and Amiga da Minha Mulher, Seu Jorge is one of Brazil’s most popular musicians. On 17 June, he will appear with his band at Konserthuset Stockholm! Jorge Mário da Silva was born in 1970 in Belford Roxo, Rio de Janeiro. He knew early on that he wanted to be a musician, and already in childhood, he worked now and then as a dancer and singer. At 19, he moved away from home and was homeless for a period before coming into contact with the theatre world. He signed up to audition for a musical and was discovered there by clarinettist Paulo Moura, an event that would change his life completely. Seu Jorge (a nickname given to him by drummer and close friend Marcelo Yuka) joined the popular band Farofa Carioca and then released the solo album Samba Esporte Fino in 2001. The debut album was followed up by several successful singles, albums and collaborations with Ana Carolina, among others. Two years in a row, 2003 and 2004, he won the Paulista Art Critics Association (APCA) distinction for Best Brazilian Singer of the Year. With the album CRU from 2004, Seu Jorge had his major international breakthrough and regularly toured the entire world. Between 2006 and 2011, he released several hit albums which further secured his position as one of Brazil’s top musicians. 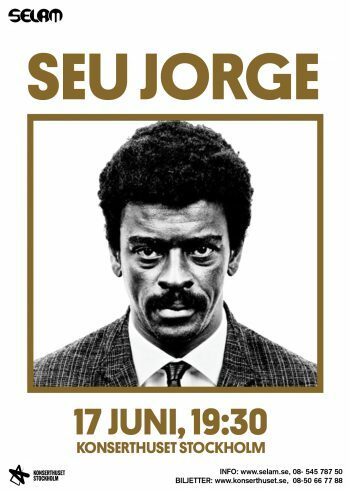 In addition to music, Seu Jorge has also made a splash as an actor and was in movies such as A Life Aquatic and City of God. Seu Jorge defines himself as a pop singer and composer, where the music is a blend of different genres, but is always based on the Brazilian samba.